What's It To YOU? 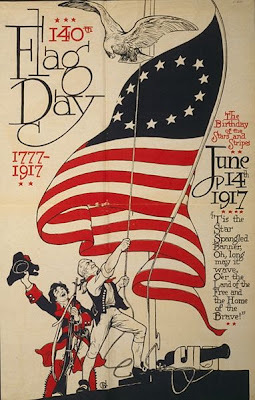 : Flag Day & Birthday wishes! I love the United States of America! Most anyone who knows me, knows this. I especially love Flag Day. I also have great respect for the flag of the United States of America! For years now, I have worn a heart flag pin. Way before 9-11 and some people started wearing pins and ribbons and such, for a short while. I still wear my pin, the current one I have I got from AVON in 2004. I have others that I wore before that. When I worked at the Mesquite Library as a page, one of my duties was to take care of the flag. On days that I worked opening, I was to put it up the flag pole. On days that I worked closing, I was to pull it down and fold it when it got dark or the library closed, whichever came first. I was a bit of a stickler on flag etiquette. Meaning that if it started raining, I was right out there to get the flag down or if it was raining, I would not even put it out. We made sure to fold it properly every night, too. I loved this task of being in charge of the flag. This day is also special because it is the birthday of two very important people in my life. My Uncle Larry is my mom's brother, who we did not know until 1981. This is when we flew to Florida to meet my mom's dad for the first time. She was 32 yrs old. The other is a great friend from high school. Rob was a very important part of my high school friendships and learning. Some of the best times we had were during and after the ACT prep classes, remember?! LOL! I wasn't even close the friend to him that he was to me! Happy Birthday Larry & Rob...hope your day was great!!! Happy Flag Day to everyone else! I honestly didn't even know it was flag day..... I must do better! I hope your devotion to the ideas that the flag represents is equal or greater to your devotion to the flag itself, which is, fater all, when all's said and done, just a piece of cloth.